Guru Yoga — the union of the mind of the disciple with that of the Guru — is quintessential to success on the path of Vajrayana. Without the close supervision, advice and teaching of a qualified master, it is extremely difficult to make progress, and very easy to substitute one’s own preconceptions, desires and ignorance for the pure goals, philosophy and insight needed to practice properly and achieve the highest attainment. 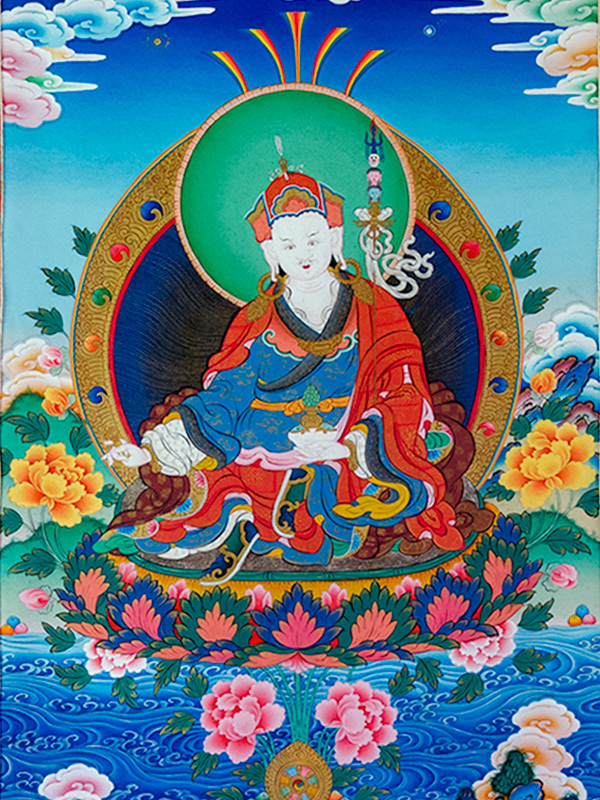 For practitioners of the Nyingma lineage, Padmasambhava — the great master from Oddiyana who brought Vajrayana Buddhism to Tibet, is the supreme root guru, and his realization and enlightened energy continue to bless and empower this lineage up to the present day. He is the embodiment of all the pure qualities of an enlightened being, and the focus and object of devotion of all Nyingma Guru Yoga practices. In 1982, Ven. Peling Rinpoche dictated The Profound Nying Thig (Heart Essence) Guru Yoga, which had spontaneously arisen in his mind, to his heart son, Jigme. Rinpoche felt that this seemingly simple practice, containing profound depth, subtlety and realization, was so inherently powerful that ritual permission or initiation was not required to recite it, and that it would engender great spiritual progress in any who practiced it regularly. The Nying Thig Guru Yoga, in addition to the one contained in the Nam Cho preliminary practices, are the two principle Guru Yogas practiced at Orgyan Dzong.